To Cite: Sarikhani Y, Bagheri Lankarani K. Mixed Payment Method, the Experience of a New Payment Method for Health Service Providers in Family Physician Program in Iran, Shiraz E-Med J. 2013 ; 14(4):e16651. doi: 10.17795/semj16651. Background: Beside the structural and managerial reforms in health system, high considerations are devoted to the financial arrangements. Reforming financial arrangements of health systems, method of payment to health services providers has always been one of the most important issues. Objectives: In this article we have studied the experience of using a novel payment method in “Family Physician Program” in Iran. Materials and Methods: We have reviewed the official documents of Ministry of health and medical education and the “Medical Services Insurance Organization” of Iran as data sources. Results: Payment method that used for family physician program in Iran is a mixed payment method in which capitation fee, fixed monthly salary, deductibles, franchises, performance based payments, and even bounces (as an incentive payment) are used simultaneously. Conclusions: Mixed Payment Method has the potential of using the benefits of each payment methods, and minimizing their defects. It also has the risk of encountering the defects of all payment mechanisms. Nowadays, permanent change in economical, political and social factors is an undeniable fact in all countries. Therefore, governments must revise and reform their executive structures in order to meet their newly occurred needs through proper actions (1). Importance of reform in public services sectors is mostly due to their direct effect on the social welfare and eventually in sustainable development of communities (2). As one of the most important parts of public services, Health care system has attracted special attentions. Specific function of health system and its impact on welfare, development and productivity of community is the main cause of these considerations (3). Community-oriented health care and primary health care are in the core of many programs that aim to reform health systems (4). Also World Health Organization has a special emphasis on these kinds of reforming programs and encourages countries to involve community-based programs in their reforming actions (4). These particular attentions to the primary health care and community-oriented plans comes from the unique role of these approaches in responding to the main health needs of the populations (4). Beside the structural and managerial reforms, high considerations are devoted to the financial arrangements including financing sources, purchasing strategies and payment methods (5). The method of payment to health services providers has always been one of the most important issues in reforming financial arrangements of health systems (6). All current payment models have several strengths and weaknesses; so that, adoption of each ones depends on the type of health program (7). For example, “Provider Induced Demand” could be one of the most important weaknesses in the “Fee for Service” method (8).Therefore, policymakers have always been looking for the optimal method of payment to health services providers (9). Considering the importance of finding an optimal model of payment to health services providers, in this article we studied the experience of using a novel payment method in “Family Physician Program” in Iran with a critical approach. This article is a review on the Iran's experiences in using new mechanism of payment in family physician program. We have used the official documents of Ministry of health and medical education and the “Medical Services Insurance Organization” of Iran as data sources. These documents include Executive Written Regulations, Booklets of Health Services Insurance Tariffs, and Booklets of Family Physician Service Packages. The Executive Written Regulations and Booklets of Health Services Insurance Tariffs are published by ministry of health and their new versions have been published based on the necessary changes in the program. Although the Booklets of Health Services Insurance Tariffs publish by ministry of health, but tariffs are determined and approved by Insurance Council which is composed of experts from ministry of health, insurance companies, Medical Council Organization and other related organizations. Booklets of Family Physician Service Packages contain all of the services that must be rendered to the target population by family physician team. Family physician teams consist of general physicians, midwives and health workers. Gathering data for this article, we have used the final version of Booklet of Family Physician Service Packages that was published in 2007. Executive instructions, principles of financial arrangements, program monitoring and evaluation guidelines, checklists and other regulations that are necessary for implementation of the family physician program are published in Executive Written Regulations and its eleventh edition (Executive Written Regulations, 11th Ed. 2010), is used for this article. The 2011 version of Health Services Insurance Tariffs Booklets which contains deductibles, franchises and other payment shares is used as another data source of the research. We included documents which contain our research keywords including Payment Methods, Financial Arrangement, Service Packages, and Services Tariffs. “Family Physician Program” was established in 2005 by the Iranian public health sector with the aim of improving equity, access, quality and efficiency of health services. At the beginning, this program covered villages and cities with populations less than 20000, but recently it’s implemented in the cities with 50000 populations. General physicians are in the core of family physician team. According to the experiences from the existing methods of payment to health service providers, and in order to minimize the problems and design an effective payment mechanism, “Mixed Payment Method” is used in this program. In the mixed payment method, capitation fee, fixed monthly salary, deductibles, franchises, performance based payments, and even bounces (as an incentive payment) are used simultaneously. Main portion of program’s payments is based on per capita budget that is allocated to the populations that covered by this program. The government pays per capita budget to Medical Services Insurance Organization, which is a public insurance company. Then, insurance company holds contract with Medical Universities as service provider and they are responsible of providing determined services to the target population. All medical universities are public too. Based on an annual contract, medical universities pay fixed monthly salaries to the physicians and other health workforces that are involved in the program. On the other hand, the performance evaluation of general physician is effective in increasing the amount of payment. With continuous optimum performance, Payment can be even higher than the contract ceiling as an incentive payment. In addition, a few percentages of some services' costs (including diagnostic tests, some prescriptions, and etc) are paid by patients as a deductible. Finally, insurance company pays a few percentages of some services' costs to the team’s professionals. 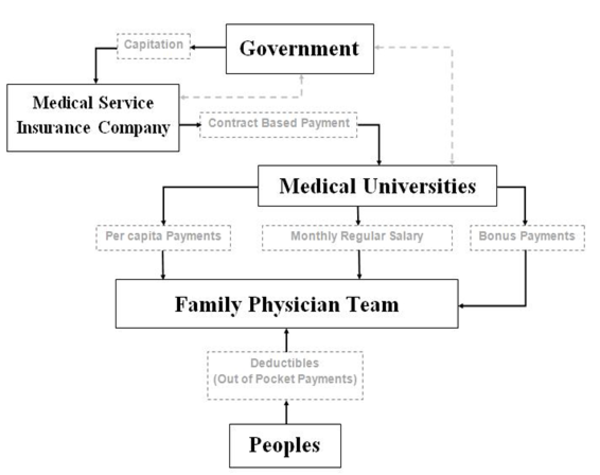 Figure 1 shows the financing process of family physician Program in Iran in a brief overview. Increasing costs of health care are forcing purchasers to demand more efficient care and meanwhile improving quality of health care has received many attentions (10). Method of payment for health services can affect the efficiency and quality of health care services to a large extent (11). Therefore success of a new health program is greatly dependent to the proper method of payment to health service providers (12). Mixed Payment Method has the potential of using the benefits of each payment methods, and minimizing their defects. It also has the risk of encountering the defects of all payment mechanisms (9). In Iran, using mixed payment mechanism in the family physician program as a new financial arrangement has many advantages. Monthly regular salaries that based on per capita budgets, has reduced the provider induced demand (13), while it’s a big problem in the Fee-for-Service (FFS) method (5). Although this method can provide financial assurance for employees (14) like the FFS method (10), the regular salaries may reduce incentive for improving the quality of services (8). As a result of creating and increasing financial incentives for physicians, performance based payments and bounces increase the quality of services (15), so it can somewhat resolve the problem of salary method (2). Improvement of health care performance and quality could be incentivized by using the compensation strategies that change behavior of health care providers (16). Performance based payments is largely dependent to the accurate metrics used for measurement of performance (17). It seems that criteria for measuring the performance of family physician team in Iran are created properly, but accuracy of the assessment process is still controversial. Limiting costs of the program, per capita payments can increase efficiency of the program (9); also, many fiscal problems of program can be solved by ensuring availability of financial resources (9). In spite of considerable advantages of this method, there are some Constraints meeting the expectations of quality service delivery (18). Deductible which is a kind of Out of Pocket payment has a little share in the program’s payments. Low amount of out of pocket, protects families from catastrophic health expenditures (19). It also reduces people's unreal demands for additional services (13). On the one hand, by limiting the consumer-induced demands and on the other hand by limiting the accessibility of services and with the risk of undermining equity in health, out of pocket payments act as a “Double-edged sword” (20). It should be noted that although the family physician program in Iran and its financing system have some defects (21), but as a reforming mechanism, this new method of payment opens new horizons in front of Iranian health system (22).In addition, by new reforms which their evidences derived from further researches, problems of this program can be reduced. So for drawing a general conclusion, more comprehensive studies on payment methods considering the national contextual factors could be helpful. Financial Disclosure: Prof. Kamran B. Lankarani was the minister of health and medical education of Islamic Republic of Iran from 2005 to 2009 during which the family physician program in rural areas was implemented in Iran. There isn’t any conflict of interest to be declared by the other authors regarding the manuscript.